Congrats to Ron E. of Southlake Tahoe, California who just won a $25.00 Restaurant.com gift code for writing a review for weBoost Drive 4G-X 50db 5-Band Repeater Kit - 470510 [700/800/1900/1700/2100mhz] at 3Gstore.com! Every week we randomly pick one product review from the previous week and award the writer a $25.00 gift code. We appreciate ALL the reviews our customers write, whether they are positive or negative - honest reviews like Ron E.\'s help other customers decide if the product is right for them. After you purchase a product from 3Gstore.com, we encourage you to log in and 3Gstore.com and leave a review letting people know how the product worked for you - you'll be helping others, and you'll automatically be entered to win a restaurant.com gift code!. This device is considerably more complicated to install in an RV than one is led to believe. We purchased the unit, along with an omnidirectional Laird Phantom external antenna. 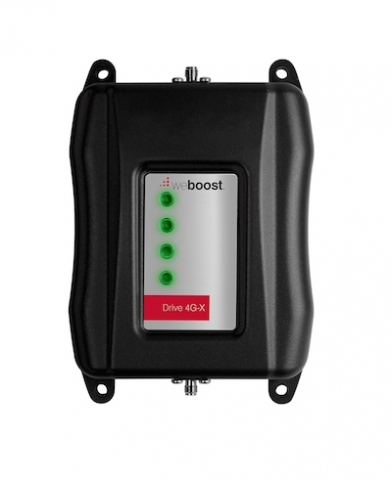 After installing the Laird on a metal base plate on the top of our RV and connecting the WeBoost amplifier, we have yet to be able to get 4 green lights to display on the unit, which tells you that it is operating at its maximum efficiency. Apparently, any red lights (we've always had at least one, more often two, and at times three and even FOUR) indicates signal interference. We've tried different types of interior antennas, driven to multiple locations and even tried increasing the distance between the interior and exterior antenna. I even tried installing some sheet metal shielding over the front cabinetry bank where we installed the amplifier to try to "block" any possible interference between the two antennas, but nothing has really helped. Finally, we tried just putting the unit in our car, using the little magnetic exterior antenna and the "candy bar" interior one and drove around to see if those worked better. They didn't. All of that said, I have seen a boost in signal strength when the amplifier is turned on, according to an app we use on my cell phone. The WeBoost engineers told me that we have always been in areas where the signal strength is already moderately strong, and that the unit is not designed to take a good signal and make it even better...in fact, that just invites signal oscillation. According to them, it will operate most efficiently in an area where the db signal strength is fairly week, turning it into one that is at least usable. We'll see. The jury is still out on this pretty expensive technology.